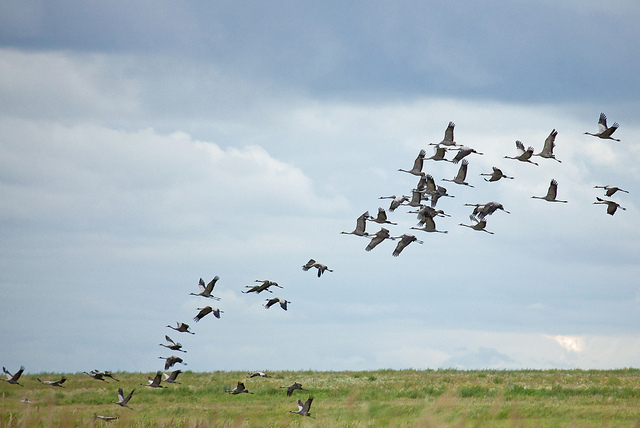 Post by David Johns, contributor to Keeping the Wild: Against the Domestication of Earth. When humans started to farm 12,000 years ago, they began to change the earth in basic ways, pushing aside other species to make room for themselves and those they favored, killing creatures they didn’t want and domesticating others, altering soils and water courses to suit themselves, and generally replacing ecological complexity with simplified landscapes. In seeking to dominate and control patches of the world—and today, the entire globe is on the human menu—they also transformed how they saw the world. They divided it between places under human control and those that were not, places inside and those outside, places that were safe and those that were to be feared. Modern advocates of setting aside large areas from human exploitation so that the millions of other species can thrive were not the ones who first created a dichotomy between places which are dominated and those which are self-willed (wildlands and waters), between species subject to imperial humans and those which live for themselves (wild creatures and plants). Since humans left Africa 60,000 years ago we have caused countless extinctions, wiping out many of the largest land creatures then on the earth during our expansion across it. But with farming, overhunting was replaced with wholesale transformation and control. We started behaving not like other keystones species, such as elephants, beavers, and wolves, which have a profound effect on the ecosystems they are part of: we sought to change the community, to remake it in our image. We claimed to own it. When we started to farm there were perhaps five or ten million of us and our destructive affects were localized. Since that time, over 600 generations, we have become more than seven billion, taking the homes and lives of others. Like Britain in India, France in Vietnam, and the US in too many places to mention, these early farmers embarked on a mission that still drives human societies—reshaping the world to suit ourselves (or our rulers). We have not lived in and been part of the wild for a very long time. The wild remains, but it is greatly diminished and its inhabitants under siege. The question humans confront is do we allow this destruction to continue until we have utterly impoverished the earth, or do we act to curb our morally inexcusable behavior, stop the slaughter, and recognize our limits? Do we share the earth by leaving large parts of it alone and off limits to exploitation and allow the many injuries to heal? Eurasian cranes, one of the species found in Portuguese cork forests. Photo by Sergey Pisarevskly, used under Creative Commons licensing. According to a recent PBS documentary—Earth: A New Wild—the choice is not so stark or difficult. We are told, by way of stories of people occupying small patches of the earth, that it is possible for humans to live in a place, make a living, and not degrade it—possible, even, to keep it wild, just wild in a different way. These patches of land, however, are not self-willed, but managed by humans. The claims are as vague as they are enthusiastic, and leave out much. Iberian lynx. Photo by Steve Slater, used under Creative Commons licensing. 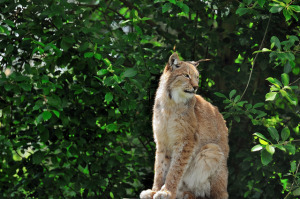 For example, the documentary takes us to Portugal, where cork forests preserve lynx and cranes while also providing crops for locals who have long cultivated the trees. There’s no question that these cork forests are better for some wildlife than some alternatives, like industrial agriculture. But is this landscape wild in the sense of whole? What has become of disturbance regimes such as fire? Are all native species present in their pre-agricultural patterns of abundance and distribution? What has been lost? We aren’t told. Instead we are told that these cork forests are sustainable for cork trees and people, that lynx and cranes thrive, and that these forests need people to survive. Whatever did the world do before we came along a few thousand years ago? Even if a place such as this can stand in the face of what is going on elsewhere, is it really an effective refuge from the global human onslaught that has devoured over half of the populations of vertebrate species in the last forty years? Is it any substitute for the “old Wild”—places that remain largely intact or have been put off limits to our insatiability? The story of the Ecuadorian Amazon is equally murky in the documentary and presented without context. Do people who have long occupied certain regions of the rainforest treat it better than oil companies? Quite possibly, although the hunting out of many species by long present local populations is all too common. We are told the Amazon we see today—lush and fecund—was home 2000 years ago to many settlements of 60,000 people or more, supported by large-scale agriculture. The forest is not pristine, we are reminded, though no one argues this despite a vigorous debate over estimates of historic Amazonian population size. The implication is that large numbers of people can live in harmony with the forest. People know how to do it. This new wild can harbor biodiversity. As with the Portugal segment, much is left out. What was lost as a result of the relatively recent human arrival 15,000 years ago? It is possible for areas to recover from human use if injuries cease and damage done can be healed. But the key is to cease inflicting injury. That is what intact protected areas are designed to do and can do quite effectively if they are in the right place, big enough, connected to other protected areas, and well enforced. 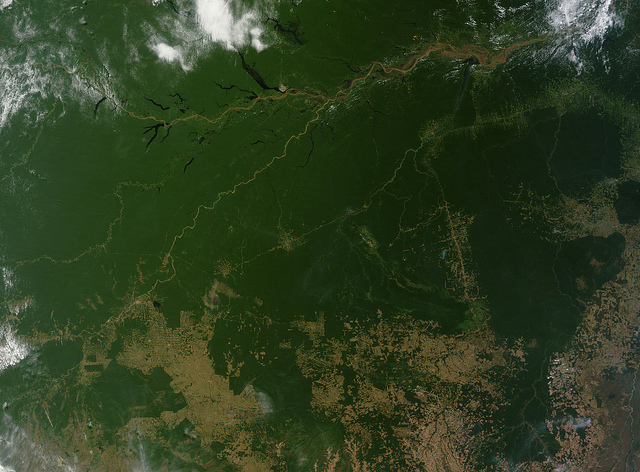 Satellite image of the Amazon showing patches of deforestation. Photo by NASA Goddard Space Flight Center, used under Creative Commons licensing. Another implication of the Amazon story is that reliance on human management is a good bet. Yet the record of humans is not a good one. Yes, some groups have done better than others, but the overarching trend is dismal. Though the question is not directly posed—Is it possible for seven billion humans, whether industrialized or desiring industrialization, to behave like benign residents of the rainforest?—we are left with notion that maybe it is. But even if it is possible, is it any substitute for areas where all native species thrive and natural disturbances operate free from efforts to control them? Asian elephant. Photo by Srikaanth Sekar, used under Creative Commons licensing. 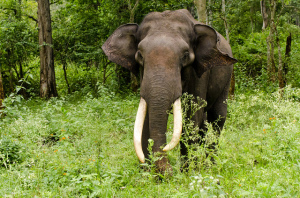 It is the story of the elephants of Sumatra that best makes clear the consequences A New Wild ignores or glosses over in the stories about Portugal and Ecuador. Elephants, we are told, are leaving the forest and coming onto “our” (human-occupied) land because of clearcutting, destroying human crops and sometimes even killing people. So while deforestation is noted as a problem for the elephants, once land is claimed from the forest by humans, that is settled and not to be questioned. Utter silence about the more than doubling of Sumatra’s human population between 1970 and 2010 to over 50 million. The solution offered by the new wild school to elephant “trespass” issue—i.e. their trying to continue to use land that was recently taken from them by human deforestation—is to drive them back into the ever diminished forest using domesticated elephants. Is there an effective plan being carried out to stem continued forest loss? To reclaim and restore the forest? It does not sound like the new wild is a meaningful wild or even a solution—at least not for elephants. No one can begrudge the search for a place where people are getting it right that the rest of us can emulate. It’s also understandable that even those who want to ensure the health of other species and of places want to avoid the difficult task of confronting the inertia of endless economic and population growth on a finite planet. But conservation cannot afford magical thinking and no amount of upbeat chatter can avoid the harsh reality that extinction rates are climbing and more and more is taken for human use, leaving less and less for all other life. We are neither smart enough nor wise enough to substitute our brains for evolution. Real wilderness—and large wilderness—is necessary for the survival of intact systems and non-human life. The best estimates are that one to two thirds of land and 30-40% of the oceans—and that must be located in the right places—needs to be strictly protected to ensure biological health of the planet. That doesn’t mean we can do whatever we want with the rest. And it is here that A New Wild’s stories may offer some guidance. But it is no substitute for the real Wild. It’s best we focus on managing ourselves. David Johns is an adjunct professor of political science at Portland State University and author of A New Conservation Politics. He wrote "With Friends Like These, Wilderness and Biodiversity Do Not Need Enemies" in Keeping the Wild: Against the Domestication of Earth.